As I detailed in an initial response, Ottawa has passively or actively supported numerous U.S.-backed military coups against progressive elected governments. But, the conclusion to Freeland’s statement above is equally absurd, even if it is a common refrain among liberals and leftists. Between 1867 and 1931, Canadian foreign policy was officially determined by London. But, describing this as a “colonial” relationship ignores the Canadian elite’s access to British capital, universities, armaments, etc., as well as Canada’s role in extending British power westward and, to a lesser extent, in Africa, Asia and the Caribbean. During the 1898-1902 occupation of Cuba the Royal Bank was the preferred banker of U.S. officials. (National U.S. banks were forbidden from establishing foreign branches until 1914.) Canadian capitalists worked with their U.S. counterparts in Central America as well. In the early 1900s, Canadian Pacific Railway President Sir William Van Horne helped the Boston-based United Fruit Company, infamous for its later role in overthrowing elected Guatemalan president Jacobo Arbenz, build the railway required to export bananas from the country. In the political realm there were also extensive ties. For instance, Canada’s longest serving Prime Minister, Mackenzie King, worked for the Rockefeller family while the mother of long-time U.S. Secretary of State Dean Acheson was from a wealthy Canadian family. Today, the ties are closer than ever. In a post U.S. election exposé titled “A look inside Palm Beach, where wealthy Canadians are one degree of separation from Donald Trump,” The Globe and Mail detailed a slew of prominent Canadians (Brian Mulroney, Charles Bronfman, George Cohon, Gerry Schwartz and Heather Reisman, Paul Desmarais’s family, etc.) with winter homes near the U.S. president’s exclusive property. A number of these individuals, the Globe reported, could get “Trump’s ear” if he turned on Canada. While there is a power imbalance between the two countries and differing interests at times, the Canadian elite sees the world and profits from it in a similar way to their U.S. counterparts. 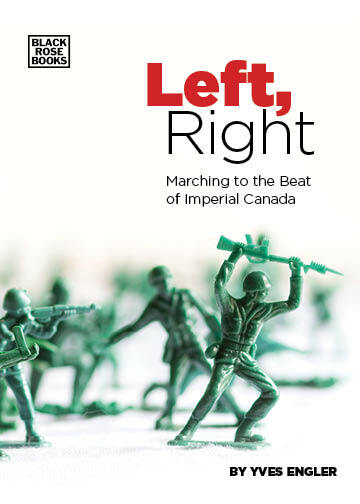 Rather than looking at Canadian foreign policy through the lens of a “colony,” a more apt framework to understand this country’s place in the world is the Canadian elite has had a privileged position with the two great powers of the past two centuries. Or, Canada progressed from an appendage of the Imperial Centre to appendage of the Imperial Centre. Canada’s opposition to Venezuela’s elected government reflects this status. “Canada has never been an imperialist power. It’s even almost funny to say that phrase: we’ve been the colony,” said the journalist-turned-politician after a Toronto meeting of foreign ministers opposed to the Venezuelan government. Sticking to contexts more directly applicable to the situation in Venezuela, Ottawa has repeatedly endorsed US-backed military coups against progressive elected leaders. Canada passively supported the ouster of Iranian Prime Minister Mohammad Mossadegh in 1953, Guatemalan President Jacobo Arbenz in 1954, Ugandan President Milton Obote (by Idi Amin) in 1971 and Chilean President Salvador Allende in 1973. In a more substantial contribution to undermining electoral democracy, Ottawa backed the Honduran military’s removal of elected president Manuel Zelaya. Before his 2009 ouster Canadian officials criticized Zelaya and afterwards condemned his attempts to return to the country. Failing to suspend its military training program, Canada was also the only major donor to Honduras — the largest recipient of Canadian assistance in Central America — that failed to sever any aid to the military government. Six months after the coup Ottawa endorsed an electoral farce and immediately recognized the new right-wing government. In the 1960s, Ottawa played a more substantial role in the ouster of pan-Africanist independence leaders Kwame Nkrumah and Patrice Lumumba. In 1966 Ghana’s Canadian-trained army overthrew Nkrumah. In an internal memo to External Affairs just after Nkrumah was ousted, Canadian high commissioner in Accra, C.E. McGaughey wrote “a wonderful thing has happened for the West in Ghana and Canada has played a worthy part.” Soon after the coup, Ottawa informed the military junta that Canada intended to carry on normal relations and Canada sent $1.82 million ($15 million today) worth of flour to Ghana. It’s in the Western Hemisphere’s poorest nation where Canada was most aggressive in opposing a progressive government. On January 31 and February 1, 2003, Jean Chrétien’s Liberal government organized an international gathering to discuss overthrowing Haiti’s elected government. No Haitian officials were invited to the “Ottawa Initiative on Haiti” where high-level US, Canadian and French officials decided that president Jean-Bertrand Aristide “must go,” the dreaded army should be recreated and that the country would be put under a Kosovo-like UN trusteeship. Canadian special forces “secured” the airport from which Aristide was bundled (“kidnapped” in his words) onto a plane by US Marines and deposited in the Central African Republic. 500 Canadian troops occupied Haiti for the next six months. Notwithstanding the three examples mentioned at the top, the most commonly cited formulation of the number of deaths in 1994 is the more vague “800,000 Tutsi and moderate Hutu.” A 1999 UN report concluded, “approximately 800,000persons were killed during the 1994 genocide in Rwanda.” As time passes, however, the regime in Kigali increases the death toll. In 2004 the Rwandan Ministry of Local Government, Community Development and Social Affairs claimed 1,074,017 died and in 2008 the government-backed Genocide Survivors Students Association of Rwanda put the number at 1,952,087. The idea there was as many, or even more, Hutu killed complicates the “long planned genocide” narrative pushed by the regime in Kigali and its Anglo-Saxon backers. So does the fact that overwhelming evidence and logic points to the Rwandan Patriotic Front (RPF) as culprits for blowing up the plane of the Hutu presidents of Rwanda and Burundi, as well as much of the Hutu-led Rwandan military command, which sparked the mass killings. While paying lip service to the complex interplay of ethnic, class and regional politics, as well as international pressures, that spurred the “Rwandan Genocide,” the 300-page report is premised on the unsubstantiated claim their was a high level plan by the Hutu government to kill all Tutsi. It ignores the overwhelming evidence (and logic) pointing to Paul Kagame’s RPF as the culprit in shooting down the presidential plane, which sparked the genocidal killings. It also emphasizes Dallaire’s perspective. A word search of the report finds 100 mentions of “Dallaire,” five times more than “Booh-Booh,” the overall commander of the UN mission. Rather than a compelling overview of the Rwandan tragedy, the OAU report highlights Canada’s power within international bodies. In a Walrus story Caplan described, “waiting for the flight back to Toronto, where I would do all my reading and writing” on a report “I called…’The Preventable Genocide. '” Partly funded by Canada, the entire initiative was instigated by US Secretary of State Madeleine Albright.